There are a couple of new moves in MiniDoom2 besides the grenades and quick weapon swap. When play-testing the first corridors of MiniDoom1 I was immediately bummed out because there was almost no way to avoid straight enemy fire. In my opinion a crouch mechanic was vital; it gave the player a defensive option besides jumping. I liked it. Crouching makes you invulnerable from most ranged attacks. But it removes your ability to move, so you become more vulnerable to enemies like pinkys. It’s a cool trade-off I think. But then crouching became useless when the enemies where not directly in front of you. Which was way too often. This and the addition of new enemies with new ways of attacking (such as the arch-vile) demanded the addition of a more reliable way of defense. So, dodging! 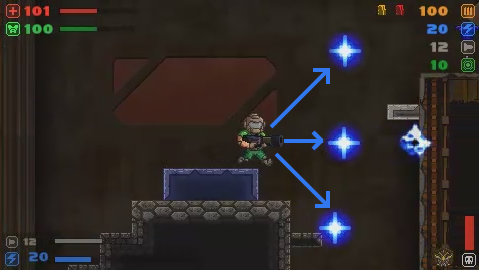 You can set a key to hold and dodge with the directional keys, or you can set two keys to dodge, one in each direction. I prefer the first option for keyboards and second for game pad. Dodging will make you invulnerable for a short burst. If you are bold you can make some great plays. Yes, the double jump will allow you to make longer jumps. But its most important feature is that it will give you much more control over your jumping. This and maybe there are other inventive ways to move using whats at hand.